Wow, quite a lot of cobwebs on this site, we brushed ’em off and dusted the place down as we figured it was time to get this blog going again. We have been putting all our time into our partner site recently and neglected this one. The plan for this blog was that it would straddle all left leaning revolutionary groups but this didn’t happen in the way we hoped and as we didn’t want to just be running a front group it’s been shelved. But now, finally we have something to talk about. Last week twenty-seven people including individuals from Bristol Anarchist Federation, Industrial Workers of the World, Socialist Party, Solidarity Federation, Socialist Workers Party, South West Against Nuclear, unaligned individuals and representatives of other events and student groups gathered to kick-start planning for International Workers Day 2012 in Bristol. I for one, was really surprised at how well the meeting went. Turn out was far better than I expected and the meeting flowed pretty smoothly. We came to a decision to organise events on both Tuesday 1st May itself and then a second, larger day of action on Saturday 5th, as unfortunately in this country May 1st is not a bank holiday. Lots of ideas came out of the meeting including a large central march as well as smaller local demos/events around the city. Others liked the idea of dong something fun to celebrate International Workers Day including plans for events and games in Bristol’s Parks and even live music or some sort of party. There were also some other very interesting ideas that it is probably best not to put up here quite yet. Our plan was to use the links the BADACA has with the Unions to organise a large demonstration. We also wanted to look to encourage single issue campaign groups and other organisation to organise events and demos to make it a week of fun and action. Many people wanted to Focus on the NHS but at the same time be clear that all the cuts are an attack on the Working Classes. Working groups have already formed to take on press, publicity, liasing with other groups, local events and writing a call out. As you can appreciate the first meeting of a large groups who don’t know each other well and in some cases actively avoid working together was mainly about idea generating. But such was the interest and energy to get things moving we set our next meting day for just four days later. Obviously that doesn’t give us time to expand the invite to more people to come along to the meeting but our next meeting after that is Sunday 8th April, 5pm upstairs at the Stag & Hounds on Old Market Street. (This may change so e-mail us anticustactionbristol@riseup.net if you are interested in getting involved or join this Facebook group). See You In The Meeting Halls, See You In The Streets! Yesterday Nick Clegg gave a talk in Bristol to some lucky ticket holders. Around 30 people had responded to a call out from the anti cuts alliance and were there to greet him. However they’d hardly even started chanting “shame on you” before he scurried inside surrounded by security. His exit 90 minutes later was more eventful, as people got in front of his car before litterally chasing him out of Bristol, one person caught up with him in traffic and managed to throw an egg at him before the car sped away on the wrong side of the road. He probably relaxed a little as he arrived in Cirencester later that evening for a meeting of libdem councilers, candidates and supporters. However even the cotswolds aren’t safe for clegg, and a small group of anarchists gatherd outside with bannners to proclaim their hatred of him and the system he represents. As people left the talk, ten showed their support for the protest, with only two declaring support for their leader. This incredibly unscientific survey reveals that over 83% would prefer anarchy to Nick! Whilst waiting for Clegg, protesters were entertained by security and two vans of police who threatened to arrest anyone who crossed the road (yes, really). The police also attempted to get everyone’s details via an incredibly inaccurate quoting of Section 50, after being quoted it correctly they responded with “we don’t care what you quote” but eventually gave up after a protester retorted “but its the law?“. When Clegg himself did appear everyone present was treated to the site of him looking back shocked over his back seat as people shouted at him, hopefully he’ll think twice before coming back to the west country! 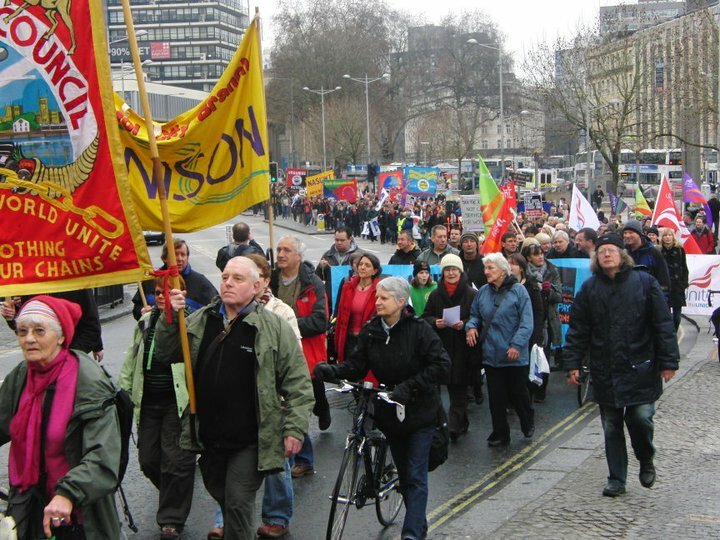 After all the build up and subsequent attention on the march 26th demo in london, and the national calls for a general strike it’s easy to forget how active and important local organising is. Here at Anti Cuts Action, we thought we’d give a round up of events across the (south)west as the fight against austerity cuts heats up across the UK (and internationally). Saturday February 19th saw just over 1000 (300 if you listen to the BBC and 3000 if you trust the organisers magic attendance counter) march through Bristol city centre in protest against government public spending cuts ahead of the councils budget setting meeting on the following Tuesday. The event was organised by Bristol and District Anti Cuts Alliance. Our sources report that the Police are using threats and intimidation in an attempt to repress anti-cuts groups forming in town across the region. Yeah yeah, not exactly an exclusive we know. But we aren’t talking about the cops coming down hard on organised groups of international anarchists having secret meetings with their leader Chris Knight. In Swindon, Wiltshire police have been harassing members of their local anti-cuts group who have been organising stalls and giving out flyers about the cuts in the town centre. On January 15th & 16th some anti-cuts activists from Bristol headed up to Manchester for the first Network-X gathering. The aim was “to establish a network that will allow libertarians to co-ordinate and support each others struggles” as part of the wider anti-cuts movement. The decision was taken to form regional networks of anti-authoritarian groups fighting the cuts. As Bristol Anarchist Federation’s Anti-cuts Action Campaign has already been working on this for a while we hope to further this network. At present we have built links and are in contact with groups and individuals in Bristol, Bath, Gloucester, Stroud, Taunton, Hereford, Wiltshire, Cardiff, Newport and slightly further away in north Wales and Northern Ireland. We don’t look to replace groups like Bristol Anti-Cuts Alliance and our affiliation form is winging its way to their secretary as I type. Our simple aim is to network with groups and individuals in the west to share ideas and mobilise for actions. Everyone seems to have taken a break for xmas this week.